The Spring Open 2015 exhibition at the Willow Gallery, Oswestry, ran from Monday 18 April to 23 May. One of the exhibits, by Stuckist artist John Bourne, is illustrated above. 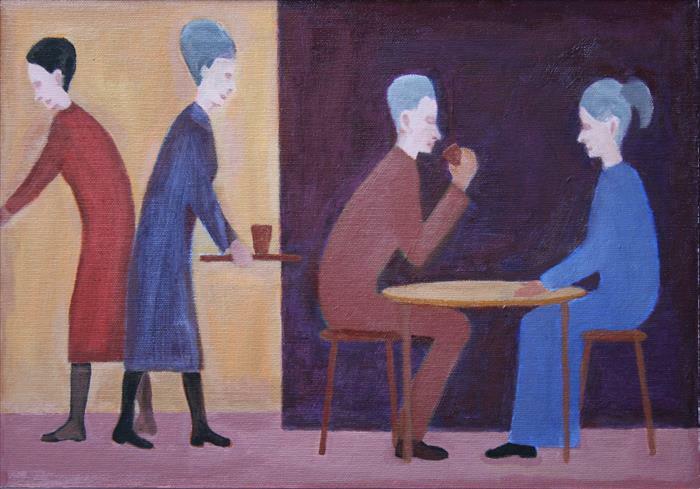 The painting was inspired by a cafe in Oswestry. This exhibition is open to all media: Paintings, sculpture, original prints, textiles, drawing, ceramics, photography, glass and metal work. I am a member of the Stuckists, who support Figurative Painting. There are many Stuckist groups world-wide. I enjoy painting street scenes and am interested in the work of L S Lowry. I also like painting interiors, including cafe scenes. I am interested in figure drawing and proportions and enjoy mixing colours, often using just Indian Red, Yellow Ochre and Cobalt Blue. Following teaching physics at the North East Wales Institute of Higher Education, I switched to painting full-time in 1986. In 2004, I helped hang the Stuckists Punk Victorian exhibition at the Walker Art Gallery, Liverpool, and in 2005, I staged an exhibition of the Wrexham Stuckists at the Oswestry Visitor Centre with the help of Elfyn Jones and Geraint Dodd. The curious thing about this picture is that there is no clue in the painting that it is upstairs! As time has gone on, my paintings have tended to become more simplified, with the figures being reduced to simple shapes.